Star Trek: Asterisk "The Gamesters of Triskelion"
Kirk, Uhura and Chekov are forced to fight for the amusement of the Providers who bet on the outcomes. 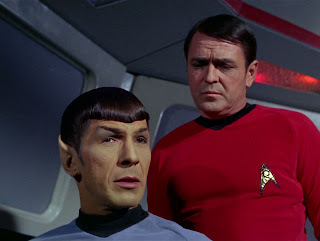 Bones and Scotty briefly consider mutiny. 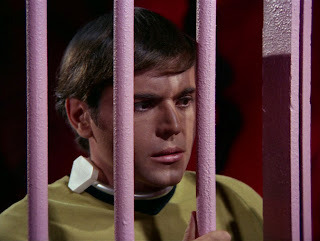 So, the idea was to beam down to an uninhabited planet that had an automatic communications station and give it a routine check, but as soon as Kirk, Uhura and Chekov step onto the transporter pad, they disappear! That is... they disappear in a manner inconsistent with the normal function of the transporter. They just blink out of existence and reappear on a planet far, far away with three suns. 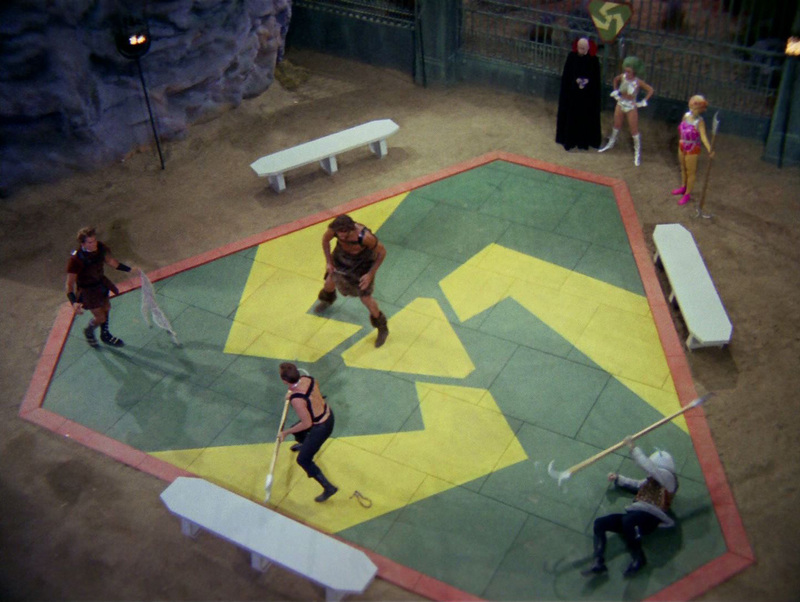 This planet is Triskelion and as soon as they get there, they have to fight for their lives. 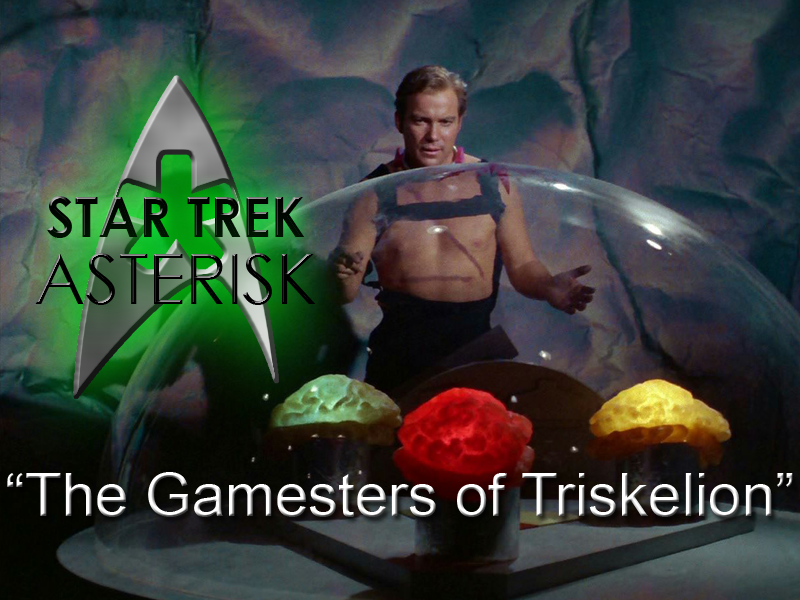 Eventually, they stop fighting and meet the master thrall of Triskelion, Galt, who looks suspiciously like The Master. Brings everyone into a dungeon, chains them up and explains that they are to fight for the Providers for the rest of their lives. The Providers were expecting them to come and arranged for their transportation. Meanwhile, back on the ship, Scotty has checked the transporter, Spock has checked all over the planet. It would seem that the landing party are nowhere to be found. In a move of desperation, Spock orders that Scotty looks at the transporter again, just to be safe. "You green-blooded son of a targ." Back on Triskelion, the landing party is taken to prison cells. In there, they find they have been given Collars of Obedience which give them great pain if they don't cooperate. Then they meet their drilling thralls. Uhura's drilling thrall is a manly man, Chekov's drilling thrall is a manly woman, and Kirk's is a womanly woman. The drilling thrall's jobs are to train our heroes into proper thralls. But Kirk takes it upon himself to teach his drilling thrall, Shahna, how to be a woman. Back on the ship, one of the science nerds finds a fluctuating energy reading in a hydrogen cloud. Spock checks it out and finds that it's an ionization trail, possibly left behind by whatever it was that took the landing party. They seem to have exhausted every option in the system where they were, so, logically, the only thing left to do is to follow this trail. Bones, however, does not like this idea one bit. He totally feels like they're giving up on their best chance at finding Kirk. Well, Kirk learns a little bit about the Providers from Shahna, but not enough to defeat them. He comes up with that plan after Spock succeeds in finding him. But once the Enterprise finds the planet, they lose control. The Providers take control of the ship and project their communications into the arena where Kirk is preparing to fight as a full fledged thrall. Then Kirk makes a plea. He's not a threat to the Providers - they have said as much - so he might as well see them face-to-face. Or... as it turns out... face-to-brain. The Providers, who are three different colored brains inside a glass dome, explain that they have evolved beyond the need for physical bodies. (Why they still need a brain is unknown.) Kirk gets talking to them and eventually discovers that he can win this the way he always wins things: a bluff! Well... a gamble, anyway. He pits his life and the freedom of all the other thralls against his ability to take out three opponents in a single match. And while he fights, the Enterprise can watch. Because they're voyeuristic like that. Well, eventually Kirk wins, obviously. All the thralls are released and the Federation officers are beamed back up. But not before Shahna expresses interest in one day living among the stars. And they all lived happily ever after and learned a valuable lesson about gambling with your life. This one has its ups and downs. It doesn't really follow logical story patterns, but it gives some great character development for Kirk. He's very good in a pinch and can gamble like no other. But transporting three people clear across the galaxy just to kidnap them for your games? Seems like a "higher being" would have something better to do with his time.